Plot Summary: When the DokiDoki and HappinessCharge PreCure teams investigate a case of children being trapped in their dreams, they find the cause is a tapir fairy who wants her son's friends to stay with him forever in the dream world. To keep the Cures from interfering, she traps all of them in happy dreams of their own. 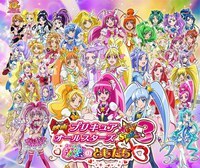 All the PreCure teams listed in the fairy handbook that is, which didn't include the new HappinessCharge team. It's up to Lovely and Princess and their fairy friends to defeat the nightmares and rescue everyone.